While the other actors of Marvel Studios' break-away smash Guardians of the Galaxy are probably still thanking their agents a million times over for the mega career boost, Chris Pratt is making like his character film Star Lord, and crash-landing in unexpected places. Bursting into the Children's Hospital of Los Angeles, in character, he quickly sent rooms of sick kids into a social media and real life craze - even letting some wear the outlaw's now infamous jacket. While it is great to see a celebrity actually doing SOMETHING MEANINGFUL with their celebritydom, other than trying to capture headlines with their love life, the boy pictured left is Dylan Prunty, he built a logo replica of his hospital while enduring treatment. Chris, at his bedside, isn't just a Guardian of the Galaxy - he is also the star (voice) of the year's other big hit - The Lego Movie. Imagine Dylan's buzz! Still, it doesn't seem like the visit to the L.A. kids hospital was a random assault either. From Chris's interview with Panzer TV; "I stole the jacket and some of the wardrobe so that, if this movie comes out and does what everyone hopes it can, I can follow the example of someone -- say, like, [Seattle Seahawks quarterback] Russell Wilson, you know -- and go visit kids." 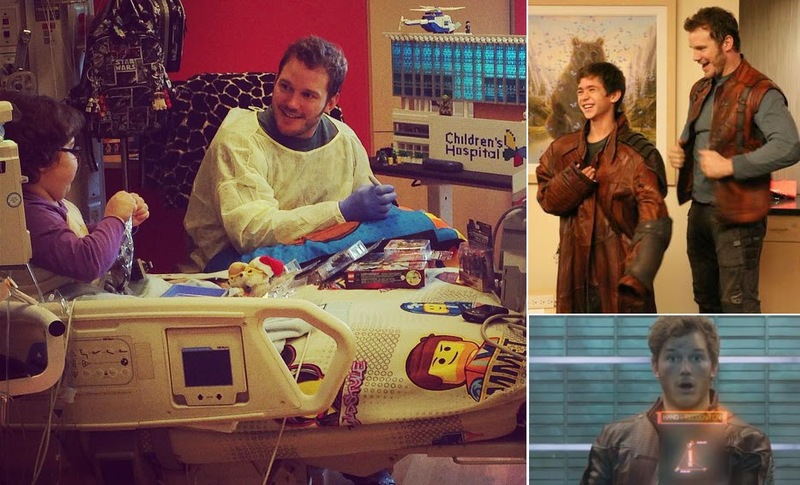 "If it was a big enough movie, to where it would mean something to a kid who's sick in the hospital for Peter Quill or Star-Lord to come visit them, I'll do that. I think that's awesome, man. That would give me real meaning for this movie, you know?" After reading that, who doesn't want to spend time building Lego with Chris? Heck, I wouldn't even sabotage his build by hiding any key pieces or anything! I would have spent time building logos with him before that. But knowing he's that good a guy diminishes the chances that I would have sabotaged his build. Hey, we all do it. It's a satisfying crunch when the other guy's Lego skyscraper falls. And building legos too! That was jam as a little kid myself, so good for young Dylan to playing them with Star-Lord. IIIIIIIIIIIIIIIIIIII! I'm hooked on playing some legos! I'm so glad my girl's not preggos. So I'm busy playing logos, it's trueeeee!" See, it's 'Awesome Mix Vol3' right here on IADW! Nice one Dale. Somehow I think more wars would be solved if all leaders had to sit and build Lego's together... actually, it might start a few wars, so best just to leave it as is!